The Red Dot expert committee has announced the winners of the Red Dot Award 2017. 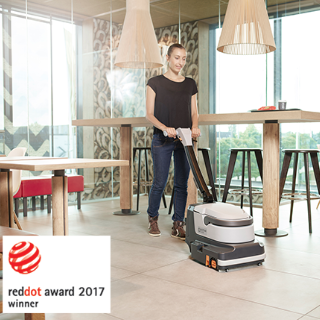 For the second consecutive year Nilfisk is among the winners with two Red Dot Awards for outstanding product design. According to CEO of the Red Dot Award, the design quality of the products has been pivotal for the recognition: “The Red Dot winners have recognized that good design and economic success go hand in hand. The award by the critical Red Dot jury documents their high design quality and is indicative of their successful design policy”, explains Professor Dr. Peter Zec, founder and CEO of Red Dot Awards. Both the SC100 and SC250 micro scrubber have been designed to provide a more productive and efficient alternative to traditional mop and bucket cleaning. According to Domenico Coppa, Director of Product Management, Floorcare from Nilfisk both products were designed based on customer needs: “For the SC100 we wanted to develop a very light weight solution that could easily be carried around” Domenico Coppa explains and continues. “And for the Lithium Battery operated SC250 we wanted to offer a compact and maneuverable product able to scrub as well as sweep in one single pass, reducing the time spent on cleaning”. 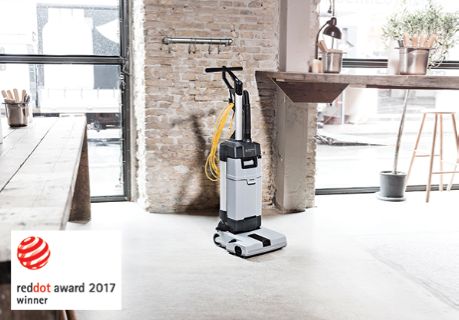 The award winning micro scrubbers from Nilfisk were selected by a jury of around 40 independent designers, design professors and specialist journalists who tested, discussed and assessed each individual product. For the 2017 awards the jury received over 5,500 entries from 54 countries.